Mid South Contractors ULC is a Windsor, Ontario, based company operated by a proven Canadian management team. We have the experience necessary to complete any commercial, industrial, green energy, or service project on schedule and under budget. 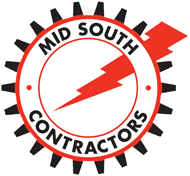 Mid South has undertaken many electrical projects with challenging schedules and has always provided outstanding results. Having quality personnel who understand Canadian safety laws and codes gives us a head-start on projects in Ontario and environs. Our list of satisfied customers continues to grow and we are pleased that they return to us again and again.